A new word was invented by Kristen when she RSVP’d to my “clay class” — Clabia. Wow. Melding two things I love: clay and labia. I’m copywriting the word Claybia for the workshops I am holding now. 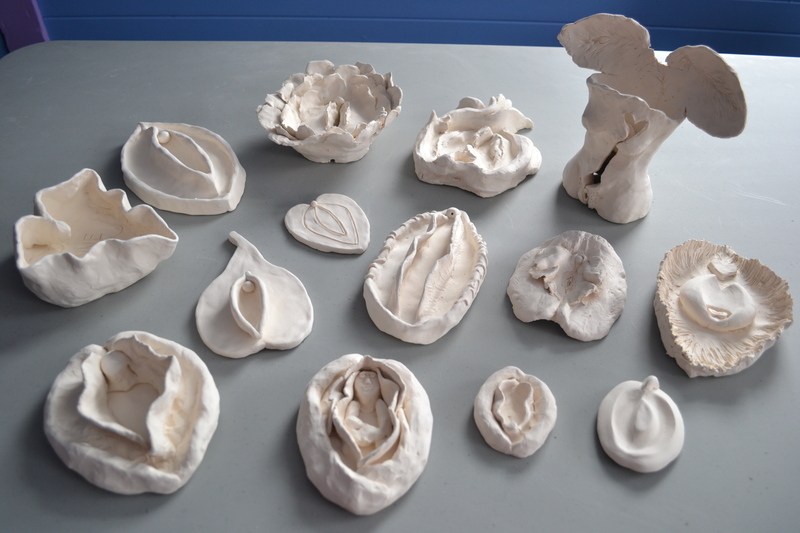 They’re not really classes; I don’t teach you how to make a labia – I create a safe space to explore and sculpt. I held the first one last month: I shared my journey that began when I heard someone say that ‘when the lower heart is abused, the upper heart shuts down.” I was in a clay class at the time, and began sculpting labia in clay to heal my own lower heart abuse. It’s been healing, liberating, and now is a source of joy. I also shared a meditation on kindness that left everyone feeling … we all shared our one word, and they were all different. Mine was yummy. Claybia is such a yummy name and concept – and you’re doing what you love.